The literature on managing water utilities is dominated by technical tomes on how to implement the latest engineering developments to improve services. Engineers often see marketing only as peripheral their quest to provide a reliable and safe water supply. It is therefore a delight to read a book on how to improve services in water utilities using marketing techniques common in other industries. 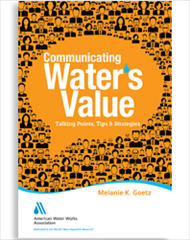 The book delves into the non-rational (a term I prefer above ‘irrational’) aspects of human psychology and explains how the latest marketing techniques from the competitive commercial world can be applied to enhance the value proposition of water utilities. Marketing has earned itself a bad name for being deceptive and manipulative, which is one of the reasons it is not often practiced in public services. Melanie’s book shows, however, that good marketing can tap into the forces of psychology and be used for good instead of evil. Melanie recognised in the book that her work is “preaching to the choir”. This book should be read by engineers, economists, accountants and all other professions that are normally at a distance from the customer interface. As pointed out in the latter part of the book, innovation can only arise from positive deviance. Daring to be different and break the shackles of tradition will not be easy in an industry dominated by traditional thinking.